Thesis Summary: Privet Fund LP is long GSIGQ common stock. Our post-emergence price target is $5.00 per common share, an internal rate of return of 123% based on closing price of $2.70 and right to purchase .99 shares for every 1 share currently owned at a price of $1.80 per share. The market has failed to fully price in the impact of the Plan of Reorganization that was confirmed on Thursday, May 27, 2010. Read the post in full. James P. O’Shaughnessy’s What works on Wall Street is one of my favorite books on investing. 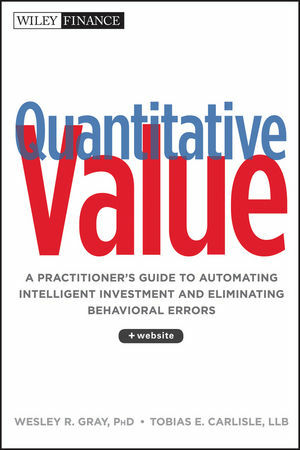 The thing that I like most about the book is O’Shaughnessy use of data to slaughter several sacred value investing cows, one of which I mentioned yesterday (see The Small Cap Paradox: A problem with LSV’s Contrarian Investment, Extrapolation, and Risk in practice). Some analysts believe that a one-year change in earnings is meaningless, and we would be better off focusing on five-year growth rates. This, they argue, is enough time to separate the one-trick pony from the true thoroughbred. Unfortunately, five years of big earnings gains doesn’t help us pick thoroughbreds either. Starting on December 31, 1954 (we need five years of data to compute the compound five-year earnings growth rate), $10,000 invested in the 50 stocks from the All Stocks universe with the highest five-year compound earnings-per-share growth rates grew to $1,287,685 by the end of 2003, a compound return of 10.42 percent (Table 12-1). A $10,000 investment in the All Stocks universe on December 31, 1954 was worth $3,519,152 on December 31, 2003, a return of 12.71 percent a year. Much like the 50 stocks with the highest one-year earnings gains, investors get dazzled by high five-year earnings growth rates and bid prices to unsustainable levels. When the future earnings are lower than expected, investors punish their former darlings and prices swoon. The evidence shows that it is a mistake to get overly excited by big earnings gains. Five-year growth rates are clearly mean reverting, and I love to see an intuitive strategy beaten by a little reversion to the mean. Yesterday’s post on LSV Asset Management’s performance reminded me of the practical difficulties of implementing many theoretically well-performed investment strategies. LSV Asset Management is an outgrowth of the research conducted by Josef Lakonishok, Andrei Shleifer, and Robert Vishny. 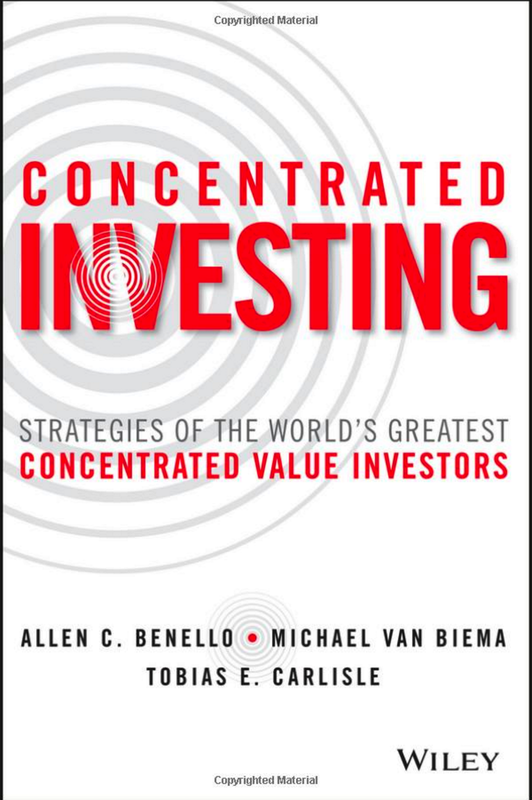 They are perhaps best known for the Contrarian Investment, Extrapolation, and Risk paper, which, among other things, analyzed low price-to-book value stocks in deciles (an approach possibly suggested by Roger Ibbotson’s study Decile Portfolios of the New York Stock Exchange, 1967 – 1984). 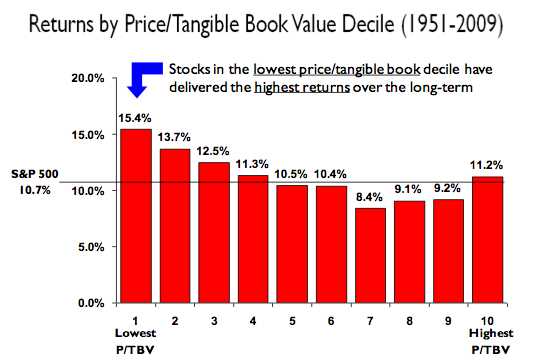 They found that low price-to-book value stocks out perform, and in rank order (the cheapest decile outperforms the next cheapest decile and so on). The problem with the approach is that the lowest price-to-book value deciles – that is, the cheapest and therefore best performed deciles – are uninvestable. Damodaran’s solution for why some market-beating strategies that work on paper fail in the real world is transaction costs. But it’s not the only reason. Some strategies are simply impossible to implement, and LSV’s low decile price-to-book value strategy is one such strategy. Most academic studies of market capitalization sort stocks by deciles (10 percent) and review how an investment in each fares over time. The studies are nearly unanimous in their findings that small stocks (those in the lowest four deciles) do significantly better than large ones. We too have found tremendous returns from tiny stocks. The glaring problem with this method, when used with the Compustat database, is that it’s virtually impossible to buy the stocks that account for the performance advantage of small capitalization strategies. Table 4-9 illustrates the problem. On December 31, 2003, approximately 8,178 stocks in the active Compustat database had both year-end prices and a number for common shares outstanding. If we sorted the database by decile, each decile would be made up of 818 stocks. 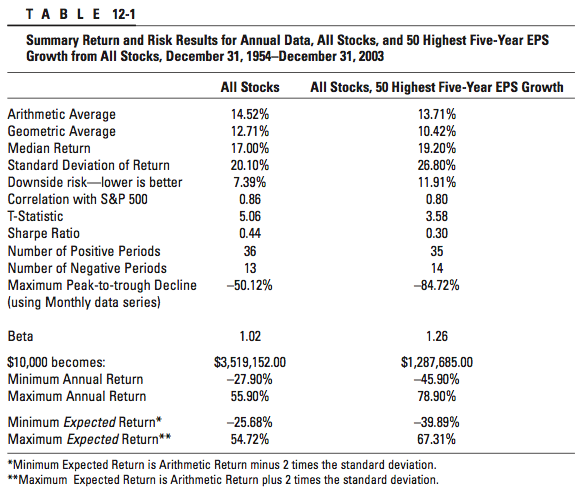 As Table 4-9 shows, market capitalization doesn’t get past $150 million until you get to decile 6. The top market capitalization in the fourth decile is $61 million, a number far too small to allow widespread buying of those stocks. The only way to achieve these stellar returns is to invest only a few million dollars in over 2,000 stocks. Precious few investors can do that. The stocks are far too small for a mutual fund to buy and far too numerous for an individual to tackle. So there they sit, tantalizingly out of reach of nearly everyone. What’s more, even if you could spread $2,000,000 over 2,000 names, the bid–ask spread would eat you alive. This presents an interesting paradox: Small-cap mutual funds justify their investments using academic research that shows small stocks outperforming large ones, yet the funds themselves cannot buy the stocks that provide the lion’s share of performance because of a lack of trading liquidity. A review of the Morningstar Mutual Fund database proves this. On December 31, 2003, the median market capitalization of the 1,215 mutual funds in Morningstar’s all equity, small-cap category was $967 million. That’s right between decile 7 and 8 from the Compustat universe—hardly small. The good news is, there are other strategies that do work. A proprietary investment model is used to rank a universe of stocks based on a variety of factors we believe to be predictive of future stock returns. The process is continuously refined and enhanced by our investment team although the basic philosophy has never changed – a combination of value and momentum factors. We then overlay strict risk controls that limit the over- or under-exposure of the portfolio to industry and sector concentrations.We also limit exposures in individual securities to ensure the portfolios are broadly diversified, further controlling risk. The LSV Value Equity Fund has $1.7 Billion under management, but the strategy is actually used to manage $22.2 billion in assets in various LSV funds. The fund’s objective is to achieve 200 basis points in excess returns before expenses. 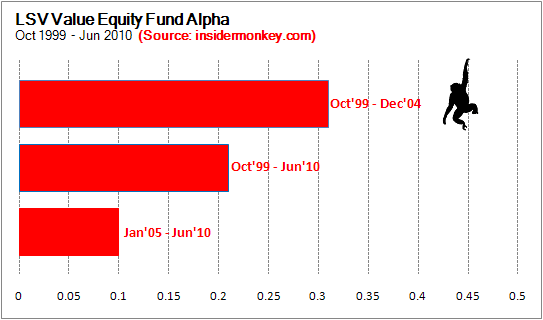 Considering that the LSV Value Equity Fund has an expense ratio of 0.65%, its alpha should not be less than 1.35%. The minimum investment is set at $100,000, so this fund is really not for small investors. See the article from Insider Monkey. AVNW is an excellent opportunity to invest in a leading wireless backhaul producer at 19% EV/Sales and below tangible book value, while backhaul traffic continues to grow rapidly, bookings have bottomed and North American business activity begins to pick up. AVNW has a very overcapitalized balance sheet with $137mm of net cash ($2.30/share) as of 6/30, a returning CEO who has tremendous knowledge and background in the business, and a new cost cutting program that will boost operating margins inline with business conditions and yield sustainable profitability at current trough revenue levels. Not to mention a recently announced active 6% shareholder Ramius, which outlines the opportunity well in a recent 13D filing. I believe an investment in AVNW today has very little downside risk and 100%+ upside potential over next 1-2 years. Last night’s quarterly results and large guidance range for next quarter may provide a great entry point tomorrow. Developed market wireless subscriber growth appears to have stalled, but developing markets are growing rapidly and in many cases, the entire telecom infrastructure is wireless, providing a nice tailwind for Aviat. The keys for Aviat are new network placements and add on capacity as backhaul bottlenecks continue to occur globally. 60% of Aviat’s revenue is outside of North America currently, with Africa revenue being volatile the last 23 years as only 2 real customers historically and consolidation of carriers has hurt Aviat. Europe is having problems and it appears both it and Africa are currently losing money in their operations. Russia activity is picking up and is a key region for AVNW. Asia Pac continues to grow and management is optimistic in its future and ability to generate sound profitability, albeit exact margins there now are tough to determine. The 10k breaks out North America vs. International operators and it appears N.A is breakeven, but a lot of costs associated with N.A. are really International given AVNW is based in CA and a lot of corporate costs associated with running the International ops are baked into the N.A. #s. Tough to say how much but management acknowledges this issue. The general consensus is networks are moving rapidly to 4G/LTE, however, in reality Aviat believes there still exists a very large market for TDM/3G equipment, as voice uptime is more critical than data uptime. Aviat is very strong in TDM and will continue to leverage this as they build out there 4G/WIMAX abilities, given backhaul networks require more and more traffic provisioning cellular base station traffic is up 10 fold in 3 years and expected to double every 2 years, according to Yankee Group. There is quite a bit of competition in this area with Ceragon and Dragonwave being 2 pure play comps and obviously Ericsson and Alcatel/Lucent. Ceragon is a very good competitor with strong product portfolio and have been aggressively recruiting Aviat personnel, especially in sales. Huawei in Taiwan has been a thorn in the industry’s side so to speak as Bank of China has offered them absurd financing and Huawei is financing their sales at or below cost, trying to capture market share. It has hurt industry pricing but can’t last forever. Customers are aware of this and continue to want multiple vendors. Generally customers seem happy with Aviat (candidly, have only talked to 2 and most feedback is from analyst community), continue to require multiple vendors and Aviat should get a nice share of the market going forward given its strong customer list, global footprint and competitive product portfolio. The new CEO Chuck Kissner was the CEO of Stratex Networks and due diligence on him over the last few weeks has come back pretty positive. He seems to be a no nonsense guy who realized the cost structure was too bloated for current business conditions and has an aggressive plan in place to adjust it the next few months. He has been there a month but knows from the board level that many investors were fed up with Harold’s growth ambitions that weren’t in sync with customer’s spending plans and the overall economic environment. * Focus on wireless transmission and their microwave backhaul solutions, where they have a strong presence and portfolio. * Make WIMAX part of the wireless product offering, not a separate business. * Expand its service businesses network mgmt, design, implementation. * Achieve profitability on current revenue run rate levels of $110-120mm per quarter. – Reduce overall cost structure by $30-35mm annually; $6-8mm per quarter in SG&A and rest in COGS through manufacturing efficiencies. The company took major charges this quarter and made it a kitchen sink quarter dropped intangibles $71mm and PP&E $10mm, sold TX manufacturing facility, announced plans to close Raleigh facility and are moving to a 100% outsourced manufacturing model. D&A will drop $12mm annually as a result. Moved to Santa Clara will save $1.5mm annually, took $2mm of cash to do it however but still a smart move. Company produced $28.3mm of operating cash flow in FY2010 (June), lower than previous years but decent given poor operating performance and bloated cost structure. $10-12mm of cash will be burned to complete this restructuring, mainly over next 2 quarters. Gross margins will be weak in the 1Q due to scrap inventory charge on India WIMAX equipment, but will return to 32-33% range by 2H. If not for this charge, GM%would be up nventory charge on India WIMAX equipment, but will return to 32-33% range by 2H. If not for this charge, GM% would be up QoQ over last quarter. OPEX was $43mm last quarter and will be down $6-7mm by Q311 (3/31/11). 2) Close down Africa and Europe, focus on North America and AsiaPac, dramatically reducing cost structure and running a 10% EBIT margin, albeit on $250-300mm of revenue. Less growth prospects, but highly profitable. This is a drastic move and most likely wouldn’t happen until 2012. Shareholder pressure may also cause this or a cleanup of the business to dress it up for a sale to strategic. Private equity would also be interested, especially today, but shareholders wouldn’t be rewarded enough as private equity would want the upside of the cost cuts and restructuring. Pristine condition with $137mm of net cash, $189mm of net working capital (current asset minus total liab) and $80mm untapped credit facility. Buyback would be a good use of cash and board has considered it, as well as tuck in acquisitions, but neither is in the cards for now until business turns and cost structure is reset. If stock doesn’t respond in a reasonable amount of time, I fully expect the board to feel pressure to consider a sale to either a strategic like Juniper or Cisco, or to private equity worst case, both of which should be at nice premiums to today’s quote. $500mm revenue business with 33-35% gross margins and nice medium-long term prospects for $90mm enterprise value. Stock has traded on balance sheet value principally the last few months and appears to have bottomed. Once cost cutting is complete and assuming revenue stays flat, AVNW should do $40-50mm of EBITDA on $450-500mm in revenue. Did $20mm on $479mm last year, plus $30-35mm of cost reductions. This would be conservative as management fully expects to grow revenue in the future given backhaul traffic growth and excellent microwave product portfolio and R&D team. At 6x, $270mm EV would yield $6.62/share. That is my base case. D&A will be down $12mm annually so I am assuming $25mm in annual D&A and $15mm of annual capex, and 25% tax rate. At $45mm in EBITDA, that would be $15mm in net income, or $.25/share, and $25mm in FCF or $.42/share. Please see below comp chart with Ceragon and Dragonwave. Ceragon is a better comp as Dragonwave is principally a WIMAX business even thought they are focused on expanding. DRWI blew up recently as its main customer Clearwire cut back its growth capex. * Bookings remain soft in Africa and N.A. doesn’t turn. * Cost cutting cuts muscle, not just fat, hurting product portfolio, performance and company’s reputation. * Huawei continues to take share with unprofitable bids. * Continued pushout of deal closings and supply shortages causes further revenue weakness below $110-120mm quarterly. * Achieving cost cutting program in size and on target, generating profitable quarters once again. * Bookings and revenue growth return. * Market recognizes turnaround and growth potential, assigning a reasonable earnings and sales multiple. See the RDI archive here.